Isn’t ultrasound a way to look inside the body? How is it therapeutic? It’s both. Ultrasound, by definition, is a oscillating sound wave that is above the range the we can hear. For diagnosis (i.e. looking inside the body) – the machine is measuring what comes back to it after that sound wave bounces off things inside the body and makes a picture based on the distance of the bounce. For therapy, those waves are used to warm the tissues for a healing effect. Isn’t a heating pad going to do the same thing? Only on the surface. The beauty of ultrasound therapy is that we can target a specific tissue at a specific depth. By coning that energy into a small space, we can get maximal therapeutic effect. A heating pad, while it feels good, can only heat the surface and cools very quickly. 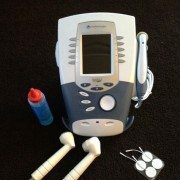 How does ultrasound help an injury? Increased blood flow. Think about how your skin turns pink when you’ve been in a warm shower. That’s because blood flow has increased at the skin. Now think about concentrating that heat to an injury. The increased blood flow will bring all the blood components in to heal the wound faster. Reduction of swelling. Think about a sprained ankle. The more swelling that is here, the less motion you have, and the more likely you are to have permanent decreased range of motion. Ultrasound helps remove that swelling to increase motion early, tendons don’t freeze up to create scar tissue. Pain relief.The movement of the ultrasound, coupled with the heat, serves as massage for the affected area. This reduces pain, helps remove toxins, and helps medication reach where they need to go. Increasing motion in old injuries. We all know that “stuck” things work better when warm. This is why we run a stuck jar under warm water to open it. This is why we don’t keep Vasoline in the refrigerator. The same concept applies to tendons and ligaments that have been “frozen” from injury. Heating and increasing blood flow allows it to soften, bring in more blood flow and break up scar tissue, resulting in better movement. No. Therapeutic ultrasound should feel like the benefits described above….warm massage. Often we will stretch the limb or affected area while doing ultrasound, but again it should not be to the point of pain, only to the point of stretch. What specific conditions warrant ultrasound?